Here is another sneak peek from Pledged! EXCERPT TWO: Meet Jared and Sophia . . .
Jared nodded at Sophia and Kezeah without any sign of recognition. With two of his Pledged up front and two at their rear, he marched them down the corridor to a flight of stairs. Once at the bottom, he ducked beneath an archway, opening onto to a gloomy, narrow tunnel. Erin, never keen on dark, claustrophobic spaces, took a deep breath and paused. “Then you’ll know for sure that the dead guys are leading this expedition,” Seth said, wanting to deny the painful burning in his heart that reconnected him with a cursed Jared. He grabbed Erin’s arm and pulled her into the passage. Jared turned back to look at her. With none of the fear or diffidence Erin and Seth expected from a boy with limited to exposure to girls – especially beautiful ones – he answered, “Of course, my lady. You’re from Norin, where I understand you live in grass huts.” He gave a sardonic smile. “But don’t despair, you’ll soon get used to bricks. Even our own Outcasts have learnt not to flinch at the sight of them.” He continued down the passage. Seth’s mouth dropped at Jared’s rudeness; this was so foreign to the Jared he had seen just moments ago in his vision. It just added to his anger at Reuel’s Curse. 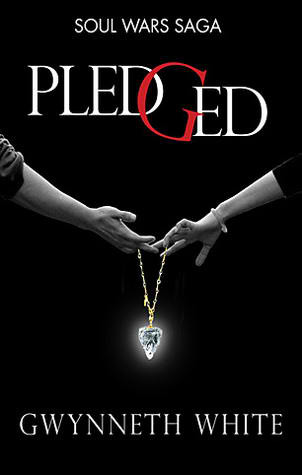 The Pledged at Sophia’s rear prodded her back; she gave him a fierce look and started walking. For Seth and Sophia, both taller than Erin and Kezeah, negotiating the tortuous twists and turns of the tunnel was no easy matter. Stooping, cursing each time they bumped their heads on the rough ceiling, they struggled after Jared, but he kept up the merciless pace until they reached a dark staircase. “Sophia!” Kezeah whispered, jabbing her in the ribs as she stepped gingerly onto the first narrow step. Sophia set her face into a cold stare, locking her hypnotic blue eyes on his. “Enough, Sophia. This isn’t a fight you can win.” Sophia’s Guardian had joined them. I was really surprised by how much I was drawn into this story once I started reading it! I kept coming back to it and picking it up, needing to find out what would happen next. 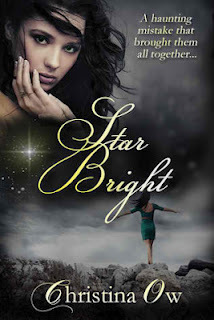 Star Bright is full of action, suspense, love, hate, and abuse. The characters are believable and there is something about the book that kept me coming back for more; I really loved that about the book! I felt a lot of sympathy for Maria and you could feel her fear and her emotions well throughout the book. Dave was a great character also and I liked how he showed his priorities in his life. I would have given the book five stars but I had to take off for a couple of things. There were many punctuation errors and grammatical errors and it became bothersome after awhile. Also throughout the book the POV would change without cluing the reader in on it. It would take me a paragraph and a half and then I would have to re-read it to figure out that someone else was talking. Also, I felt that for a YA book talking about affairs is more of an adult romance book subject. Obviously this is just my personal opinion. Other than that the story drew me in until I had finished the last page! (For those who want to know this book does contain moderate cussing) Three and a half stars. 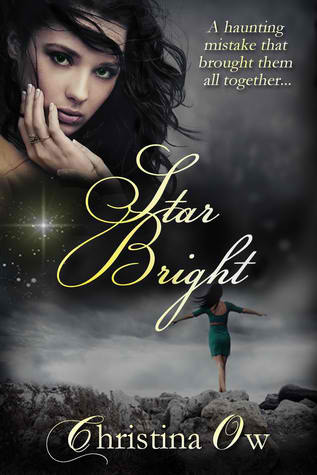 You can pick Star Bright up via Amazon and Barnes and Noble. "Clothilde." He spoke the name on a breath like a prayer. Then he lowered his head and kissed her. Her heart is lost in that first embrace, her world is shaken to its foundations. There is just one problem; her name is not Clothilde. It is Siriol de Calendri. Trained in the art of illumination in the far-off city of Venice, Siri is directed by her late brother's will to the county of Poitou in France, where she enters the guardianship of her brother's friend Sir Triston de Brielle. Once in Poitou, Siri hopes to find employment in an illuminator's shop - until Triston unexpectedly snatches her heart away with a kiss. Triston is a man of quiet honor and courage, but the guild he carries for the death of his late wife, Clothilde, has left him numb and hesitant to love again. Worse yet, Siri bears an uncanny resemblance to his lost love. Or does she? Her merry laughter and twinkling eyes are very different from his late wife's shy smiles and quiet ways. Yet when he gazes into Siri's face, all he sees is Clothilde. Then Triston's past returns to threaten them both. Will his tragic life with Clothilde be repeated with Siri? Trapped between the rivalry of the king's sons on the one hand and a neighbor out for vengeance on the other, Triston realizes it would be safer to send Siri away. But how can he bear to lose her again? Siri is determined not to be cast off and not to live in another woman's shadow. She has illuminated many a priceless book with pen and paint. But can her own vibrant spirit illuminate the darkness in Triston's soul and make his heart beat for her alone? 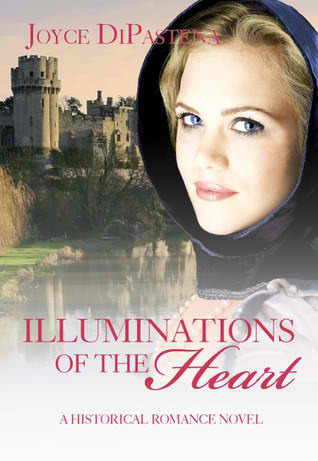 Illuminations of the Heart has been on my to-read list since I found out that Joyce DiPastena had written more novels! I fell in love with her first book, Loyalty's Web and just knew I had to read her others. I want to thank Joyce for her generosity in giving me this book to read and review! Illuminations of the Heart is great medieval romance novel, but it goes deeper than that! Ms. DiPastena delves deep into the culture of the medieval times. Her novel is well-written and the story is much more than a surface level romance. 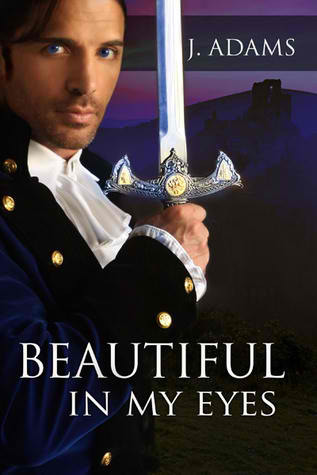 There are feuds, knights, fights, love....and so much more! I found myself being drawn to the story and trying to solve all of the mysteries. I love how much I learned about the medieval times from the book! The characters are well-developed and I became drawn into their lives and their world. I loved it and cannot wait to read her newest novel, Dangerous Favor. Five stars! You can pick up Illuminations of the Heart via Amazon and Barnes and Noble. The winner has been emailed and notified. Congratulations and Happy Reading!!! First, I would like to thank Katie at Sterling Publishing for the ARC of Tiger's Destiny! Tiger's Destiny is the fourth book in the Tiger's Saga by Colleen Houck. I have been reading Ms. Houck's books since they were first self-published. This fourth book in the series is a riveting story you don't want to miss! In fact, it is by far my favorite of the series! Ms. Houck takes you on a wild ride full of adventure, emotional ups and downs, and formidable foes that don't easily give up! The words she has written creates a whole new world right before your eyes! The city of Bodha and the lords of the flame were intriguing and riveting! The love triangle between Kelsey, Kishan, and Ren continues and goes through a whole new level of emotions you cannot imagine! And finally, we get to find out how it all turns out! Tiger's Destiny brings everything full circle for the series. If you have not read this series, RUN, don't walk to the nearest store or computer and buy these books! You are truly missing out on a literary masterpiece if you have not read these books! The story is incredible and unique! It is like nothing else you have read! You can read my reviews of the first two books here. You can pre-order this book via Barnes and Noble and Amazon. New Book Release! The Thief Prince by Cheree Alsop! When her brother’s sickness forces Kit to accept the title of heir to her kingdom’s crown, she is outcast by the others and treated as inferior; but when she is forced along with the other heirs on a dangerous journey, her differences turn into strengths that may save their lives. Kit is tested both mentally and physically as she faces odds both on the battlefield and within the royal social circles. She soon realizes that her greatest challenge may be to return home with her heart in one piece. 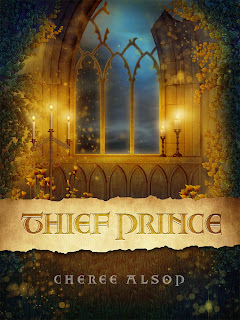 Thief Prince is a story of courage in the face of fear, and of love despite overwhelming odds. Whether you are looking for an adventure or the chance to see kingdoms beyond your world, Thief Prince is the story to sweep you away. This cover is AMAZING and the book sounds awesome! You can pick up your own copy of Thief Prince via amazon and barnes and noble. 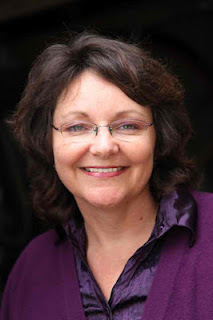 You can find out more about author Cheree Alsop on her website, goodreads, and facebook. 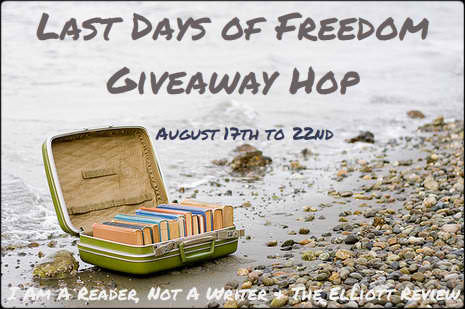 Last Days of Freedom Giveaway Hop!!! I would like to thank I Am A Reader Not A Writer and The Elliot Review for hosting this hop! Up for grabs is one ARC copy of Tiger's Destiny by Colleen Houck!!!! This series is AMAZING! I would like to thank Sterling Publishing for providing the copy! Entering is easy! You have to be or become a GFC follower of my blog and leave a comment about the Tiger's Saga with your email and GFC follower name. If you do not include your email address or your GFC follower name you will not be entered. You must include BOTH to be eligible to win. Sorry, this is open to US residents only due to shipping costs. Tiger's Destiny will be released September 4, 2012. You can pre-order your copy via Barnes and Noble or Amazon. You can read my reviews of the first two books in the Tiger Saga here. Check back here on August 24th for my review of Tiger's Destiny! You can follow author Colleen Houck via Facebook or check out her blog. Be sure to check out these other great giveaways on the list below! Interview with Collin Atkinson- model, actor and the new hottie who will be gracing the cover of Eternal Hope, the second book in Frankie Rose’s Hope Series!! 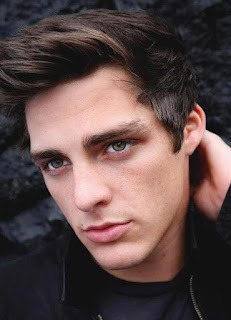 Frankie Rose asked her readers to help her find the perfect guy to become swoon worthy Daniel Montisauri, and now Operation: Find Daniel is officially over! She would like to thank all of the awesome girls who took part in the operation, please accept this ten minute chat with Collin is your reward! What appealed to you about being the cover model for Daniel? I thought it was a great opportunity and I have a love for fiction, well anything that can get you out of your mind and into someone else’s perspective. What career would you be pursuing if not for modeling? Other than modeling I really enjoy medicine and helping people, I’m still in school working toward my biology degree at the moment actually but if I was to still work in the arts I would love to be an actor. Girls in the States want to know... Boxers or briefs? If you could have dinner with anyone (dead, alive or fictional), who would it be and what would be the first thing you ask them? I would have to say Zeus, I’m a sucker for Greek mythology and would love to ask him about all the stories that went untold. From Mel of Girls Hearts Books. What sort of modeling do you normally do? Is this your first book cover? Yes this will be my first book cover, I usually do commercial and editorial modeling along with some events which is why I was so excited for this opportunity! I’m a little nerdy actually, I really enjoy videogames, horror movies, and building computers but I’m from Florida so I also like wakeboarding, boating, camping and all that stuff as well. Do you see yourself modeling 5 years from now? If not, what are your plans? I hope so if the market still calls for it, I would really like to be acting at that point, hopefully on a television series! From Carmen of Book Me! Hi Collin, Thanks for agreeing to this interview! We in the Book Blogging world love to get to know the guys gracing the covers of our favourite books! Is it weird that your purrrdy face is going to be out there as the physical embodiment of uber hot guy, Daniel Montisauri? And are you prepared for a whole heap of fangirls? I think I’m ready. I hope so anyway, is there a way to prepare for that? Haha, I think it will be a little weird because many of the people that have seen my photos are local and this will be on an entirely different scale, I think it’s awesome this series already has a fan base. I’m excited though, I think the book is great and I’m really happy to be working with Frankie! Do you enjoy reading? Have you read the Hope series? If No, then do you intend to read the book your face will be plastered all over the front of? I love reading, it’s something I think everyone should do more of, helps you escape from reality and yes, I really enjoyed it and I feel I can relate to Daniel very easily. What was your reaction when Frankie Rose asked you to be her Daniel for the Eternal Hope cover? My first thought was holy crap! Then it was…wait is this real! Once she responded I couldn’t wait to get involved further! Have you always wanted to be a model? And are there any big modeling campaigns that we would recognize you from? Actually up until about a year ago I never even considered it but a friend of the family told me I should try it and had a photographer reach me on facebook. I don’t have any major campaigns at the moment but I will be doing a shoot for the marketing of Abercrombie this September! 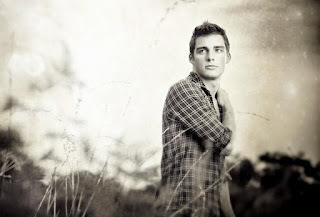 Daniel has been described as brooding and mysterious, while also being vulnerable and completely lovable at the same! Think you share any of his personality traits? I would say I’m very similar to him, especially when you first meet me I’m pretty quiet but as I open up I’m very easy to talk to and have a very strong love for all my friends and I think that goes both ways. One of my favourite aspects of Daniel's character is his obsession with his engines. What about you, ever feel the need to get greasy-with-it under the hood of your car? Or are you strictly a lets-take-it-to-the-mechanic kind of man? I actually drive a pickup truck, a black ford f-150 my uncle gave me when I was 16, that truck is my baby haha. I don’t work on my engine per se but I do like to change my own oil, fuel filters, the basics, not on Daniel’s level but definitely not taking it to mechanic right away. And finally, Collin, the question that thousands of girls, women, and maybe even a few men, will want to know now that you're gracing the cover of Eternal hope: ARE YOU SINGLE? Sadly no, I am taken at the moment hahaha! A big shout-out to Gin from http://ginspeaks.blogspot.com for this beautiful blog banner! Meet Seth and Erin . . . Despite the heat, Seth felt icy. Dread could do that to him. Or so he had recently discovered. Deep breathing usually calmed him, so he sucked in a lungful of desert air and told himself to relax. It didn’t help. By the time he’d walked from the aircraft to the immigration hall he’d ripped off a jagged piece of thumbnail, already bitten raw. He handed his US passport to the Botswanan border official, and, after a frown, and a stamp, he joined the crowd at the baggage carousel. Botswana in southern Africa was the last place on earth he’d ever have picked for a holiday destination. But he wasn’t here on holiday. Not even close. His backpack was slow in coming. Tired from his long-haul flight from New York, he leaned against the wall and closed his eyes. Almost as if to mock him, the hated vision that had brought him to Botswana burst into his mind. In an instant he was back in ancient times, watching a man he knew only as Gideon. As usual, Gideon was huddled on a windswept hill with his band of hopeless soldiers, waiting to be slaughtered by a huge army gathered in the valley below. Seth snapped his eyes open to stop the battle from waging in his mind. It wasn’t that he was particularly squeamish; he’d watched enough movies to iron clad his stomach against gory visuals. But no movie had ever left him icy with dread the way Gideon’s battle did. And the reason for that was simple. The moment the visions had started, he had known that the war, fought so long ago in a place he’d never heard of, was far from over. And, as reluctant as he was, he too was being enlisted to fight in a cause he didn’t understand or want. He forced himself to focus on the present: Erin, who waited for him in the arrivals hall; his brother Kyle, whom he’d come to Botswana to visit; Kyle’s expedition to find the Lost City of the Kalahari . . . He ripped off another piece of fingernail. Thinking about the search for the Lost City was almost as bad as the war-vision. I hope Kyle never finds the damned place. He slapped his hand on his thigh. Enough! Grabbing his backpack off the carousel, he set his face into a smile and strode into the arrivals hall. The first hurdle was finding Erin. She was due to arrive an hour earlier on a flight from Cape Town in South Africa, one of Botswana’s neighbours. He’d never met her, although they had spoken over the phone once. Then she’d described herself as “a short, seventeen-year-old (a year younger than him) with a mass of ginger hair.” She’d sounded nice. Meeting her was the one ray of brightness in this otherwise dark picture. “Mysterious.” Erin cocked her head to one side, seemingly appraising him. He knew he had been accurate when he’d told her he was tall and dark-haired. But what he had failed to mention was what girls had often said they liked about him: his strong, angular face, softened by expressive brown eyes. He watched her eyes rove over his grey Muse: Resistance t-shirt, taking in his broad shoulders and chest. From there they darted down his black camo-pants to his boots. Amused by her blatant assessment, he cocked his head to one side, watching her. Suddenly Erin giggled – was she embarrassed? – and picked up her bag. 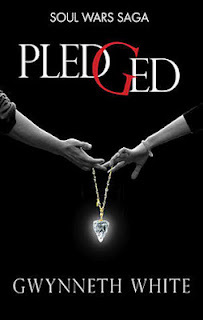 Be sure to check back for more excerpts and a giveaway of Pledged by Gwynneth White! World's Apart by Anne Ashby on sale for $0.99!!! I just recently read and reviewed World's Apart by author Anne Ashby. This is a great adult romance novel, with a lot of sizzle! And it is on sale this weekend at The Wild Rose Press for only $.99! This is a great deal so hop on over and grab a copy! Also, World's Apart will be on sale for TWO WEEKS (how awesome is that!) at Amazon, Barnes and Noble, All Romance, Fictionwise, and Bookstrand! So find your preferred online book retailer and pick up your ebook today! New Zealand widow Raven thinks her mother's American fiancé is the loveliest man. Visiting his home in Maryland, she unfortunately finds his son is the exact opposite. Greg's animosity and distrust forces Raven into an unpalatable position of safeguarding her mother's happiness. His arrogant assumption his father has been conned by a gold digger enrages Raven and she assumes the mantle to prove him wrong. Soon finding herself attracted to Greg, Raven is certain he's incapable of feeling anything deeper than the lust he makes no attempt to hide. Even if she is wrong about him, she can't extricate herself from her pretence and she's afraid he'll never forgive her deception, her lies. Can he ever understand her reasons for pretending to be engaged to his father? She was his father's fiancée, wasn't she? Greg discovers Raven's subterfuge within days of her arrival. His initial enjoyment of her antics quickly palls as his feelings for her deepen. Desperate to bring her lies into the open, he maneuvers her into a situation where she'll be forced to own up, only to have his scheme backfire. Giselle Mackenzie has a great life. She is the mother of an adorable little boy, the wife of a painfully-handsome Scotsman, and the daughter of one of the best men she has ever known. She is selfless and a comfort to everyone around her. But Giselle is about to face a personal trial that will shake the self-confidence she has always owned and cause her to question her worth. Julian Mackenzie loves his wife more than life itself. When an emotionally painful ordeal rocks her world, Julian is determined to be the the knight she needs and prove to Giselle her value is beyond any price. Beautiful In My Eyes is an emotional story of a woman who is forced to deal with a physical trial that affects her feelings of self-worth. As she struggles to come to terms with what is happening to her, she has to learn to accept it and herself the way that she is. It isn't easy to accept and Giselle has to learn to trust the love that she and her husband share to get her through this hard time. The love that Julian had for Giselle was so deep and true, I loved the bond that they shared. The way Giselle felt throughout the book seemed to me, how a woman truly would feel in those circumstances. A nicely written short story, Beautiful In My Eyes will have you re-examining what true beauty really is! Four stars out of five. You can pick up this book via Amazon and Barnes and Noble. I received this book for free. This is my honest review. New Zealand widow Raven thinks her mother's American fianc is the loveliest man. Visiting his home in Maryland, she unfortunately finds his son is the exact opposite. Greg's animosity and distrust forces Raven into an unpalatable position of safeguarding her mother's happiness. His arrogant assumption his father has been conned by a gold digger enrages Raven and she assumes the mantle to prove him wrong. Soon finding herself attracted to Greg, Raven is certain he's incapable of feeling anything deeper than the lust he makes no attempt to hide. Even if she is wrong about him, she can't extricate herself from her pretence and she's afraid he'll never forgive her deception, her lies. Can he ever understand her reasons for pretending to be engaged to his father? She was his father's fiance, wasn't she? Greg discovers Raven's subterfuge within days of her arrival. His initial enjoyment of her antics quickly palls as his feelings for her deepen. Desperate to bring her lies into the open, he maneuvers her into a situation where she'll be forced to own up, only to have his scheme backfire. But Raven has other secrets. Secrets that could drive Greg away, forever. I always enjoy a book written by author Anne Ashby! If you are looking to leave your world behind and enter a great romance novel, then her books are always a great choice! Worlds Apart is a great book full of misunderstandings, forgiveness, and learning to let yourself love. I loved Raven and Greg's characters! Raven is spunky and will not allow her family to be judged wrongly. Greg wants to protect his father at all costs. The sparks fly between the two of them even though they are so different and each hiding something from the other. Will Raven and Greg have the courage to come clean and admit to their true feelings? You can cut the sensual tension in this book with a knife, so watch out, there is a whole lot of sizzle in this one! Five stars for a great sensual romance novel! You can pick this book up via Amazon and Barnes and Noble. You can also pick it up at The Wild Rose Press. I received this book for free and this is my honest review. Look what came in the mail!!!!! Tiger's Destiny by Colleen Houck!!! This is awesome!!!! I will giving one away August 17th-22nd! So be sure to check back then for a chance to win!!! *squee* Tiger's Destiny is book four in the Tiger's Series by Colleeen Houck. If you have not read this series, I HIGHLY recommend it! I have been a fan of hers since the first two books were self-published by her. I have read all of these books and the story is wonderful and beautifully written! This is a wonderful YA fantasy series that you will not be able to put down! For more information check out Colleen's website. You can pre-order Tiger's Destiny at Barnes and Noble and Amazon. Happy Reading and be sure to check back here August 17-22 for a chance to win your own ARC copy of Tiger's Destiny!!! Hop on over to Tifferz Book Review for this great giveaway! She is giving away two ARC copies of Tiger's Destiny by Colleen Houck! This book is the fourth in the Tiger Saga and is AMAZING!!! It will be released September 4th! Good luck and Happy Reading!! !